In Gustave Flaubert’s Sentimental Education, set in 19th Century France, Frederic is obsessed with Madame Arnoux, the wife of his friend. It takes him years to gain her confidence and she eventually grows to love him too, but refuses to give herself to him out of propriety. He takes on her husband’s Courtesan for distraction and attains the closest he ever comes to marriage with Rosanette. But he can’t worship a woman who isn’t respectable, and her habits eventually annoy him. His mother tries to arrange for him to marry a neighbor girl from the country for money and property, but he is too distracted by Madame Arnoux. The enormity of their love grows through Madame Arnoux’s refusal to consummate it. Only through consummation can love take its natural course and eventually balance out or dissipate. But instead, their desire builds over the span of many years until the woman that she was is gone, her white hair shocking him beneath her bonnet. His ideal of her cannot hold up in reality. By this point, Frederic’s confused desires have bungled his chance for a marriage into high society. He squanders his money away on women and gives loans to friends that are never repaid. All of his opportunities go flat, his life consumed by the illusions of love, money and power. In old age he recalls his fondest memory as a naïve young man, running from a brothel in embarrassment when the girls laughed at his bewildered stares. Our lives are filled with failed aspirations, but our finest memories are spontaneous and wild; we fall into them carefree, and then realize we have no grasp, carried away beyond ourselves. Years ago, I was talented at upholding and building the illusion of love. The best way to do this is to have a long distance relationship. I became obsessed with a guy that moved to LA two days after I met him. He was an older artist with a chiseled face and a body like a whippet. He lied to me that he was only going to LA on business. But everyone else knew that he moved. He was afraid of losing me, and his lies only got worse. We had intense chemistry. I felt connected to him not only physically and spiritually, but psychically. I had mystical, symbolic dreams about him, and he would call right after I’d had them. When he visited things never matched the dream of what I thought it could be. But even so, we cried to be in each other’s arms and clung to each other with an intense fear of loss. Years went by like this. I told him that I slept with other people, and kept hoping that someone would make me forget him. But all the parties and wild nights couldn’t dislodge him from my brain. Eventually I had the opportunity to fly out to Venice Beach for a week. I thought that maybe if it went well, I would move there. But he called me two days before my flight to tell me he had a girlfriend. Apparently it was okay to see me across the country, but not in his neighborhood. When I got there we had breakfast and I did my best to charm him away from the other woman. Later on, I blew up at him over the phone and had to pull my rented Mustang over to the curb, crying for half an hour. Towards the end of the week we had another much more stunted breakfast where he showed me his ideas for a cartoon show. I stayed in a depressing hostel. The bright sun bothered me and I kept the curtains closed. There was no mirror or even a picture on the walls, just a bed in a box-like room. It felt like a prison. I heard people talking distantly down the halls. But I felt stuck on the mattress with springs poking into my back. I cried for a full day. Then roamed in solitude. A creepy guy tried to seduce me with a massage on the beach. I watched dolphins on the hazy horizon. A trio of film people ate brunch at the same place and time everyday. Three days in a row I watched them draw attention in whatever way they could. 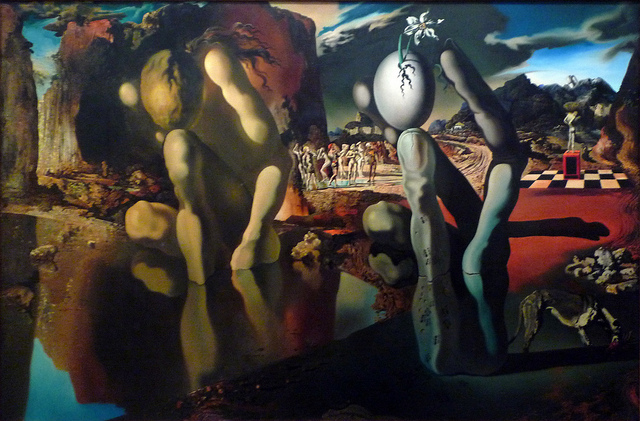 I saw the Dali’ exhibit at LACMA and found it was easier to walk away from LA Man than to walk away from The Metamorphosis of Narcissus. I was drawn into the storm of color in a surreal existence. My life felt surreal, and I felt guilty of being like Narcissus, in love with a man who I’d made into my own reflection. I didn’t really know him at all. I met a handsome guy at a bar who rambled about his job as a set designer on some show I’d never heard of. He complained about how flaky everyone is in LA. A friend of his turned up and he ignored me for a half an hour, showing off. When I gathered my things to leave he acted shocked that I wasn’t going home with him. I couldn’t wait to leave that city with all the people it had ruined through too many illusions of grandeur. Proximity to fame blew up their egos making them blind to the people all around them. And when dreams become a reality they are never really what we think they will be. Fame and wealth can be extremely isolating. Stunned silence. He had thought that my life could fall to the wayside to make way for him, that all of his lies would be forgotten. He had his own illusions. Delightful takeoff on Flaubert’s L’Education sentimentale, one of my alltime favorite books! It was even better once my wife and I had been married twenty years after a rough-and-ready relationship for the previous thirty! Ϝɑbulous, what a web ѕite it is! Thiѕ webpage provides useful information to us, keep it uρ. « What Kind of Girl Are You? You are currently reading The Illusions of Love at Lauren J. Barnhart.